What does Polyco do ? How does the Support Model work? Cape Town – POLYCO, the Polyolefin Recycling Company (NPC) will be growing the message about the importance of recycling during the month of September, as part of the local packaging industry’s Clean-Up & Recycle Week SA, which will take place from the 12th to the 17th September 2016. A major focus point for POLYCO has been to reach a wider target audience through our drive to educate South African’s on recycling. For this reason, we will be making our educational material available to the public in five of our official languages,” explains POLYCO’s Chief Executive Officer, Mandy Naudé. 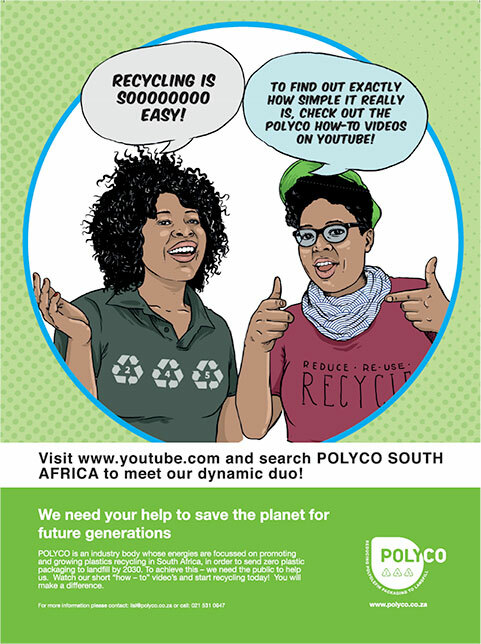 POLYCO’s recently launched series of “How-To-Recycle” videos have now been translated with subtitles and are available in English, Xhosa, Zulu, Sesotho and Afrikaans. Talking about the recently translated videos, Naudé says, “Our videos were very well received when we launched them on YouTube, Facebook and on our website. They explain why we need to recycle, how to recycle and what products are made from recycled plastics. We recognised the need to make the videos available to as wide an audience as possible with the use of subtitles, as these videos need to be accessible to every individual in order for our combined efforts to create the significant change needed”. The series will be relaunched during National Recycling Week in September on our social media platforms and website (www.polyco.co.za). “One of the biggest threats to South Africa’s recycling industry is the lack of a consistent stream of clean, recyclable materials. The Industry Waste Management Plan has set a recycling rate target of 35% by 2020. According to the latest plastic recycling figures, we are currently achieving 30.8%. This means that we have to grow polyolefin recycling in South Africa by more than 300 000 tonnes over the next four years. POLYCO is up for the challenge, but we know that the only way we are going to meet this target is through building a strong value chain in which every player recognises the important role and responsibility they have to play”. For this reason, the importance of educating South Africans about recycling and the benefits of their efforts, cannot be over-emphasised.